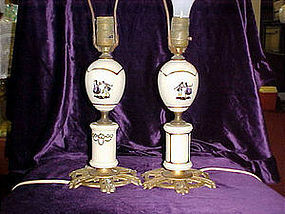 Old pair of boudoir lamps, made of porcelin with silouette style colonial dancing couple. 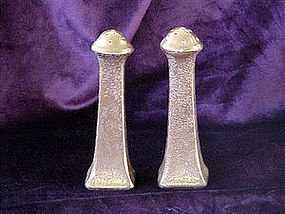 Lamps are 12 1/2" tall to the top of the socket. 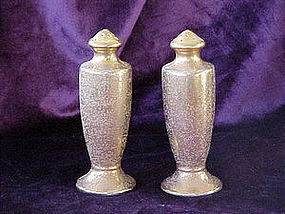 The base is made of cast metal in a filigree style. The lamps are not an identical pair. 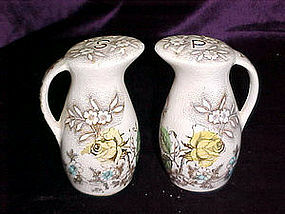 See photo for the slight difference of pattern on the bottom of the porcelin. Lamps are in great shape and both work. No repairs have been made.No shades. 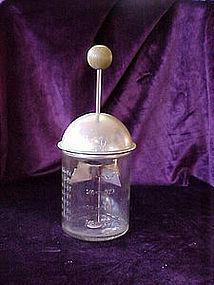 Nice old kerosene lamp.About 8 1/2" tall to top of neck. 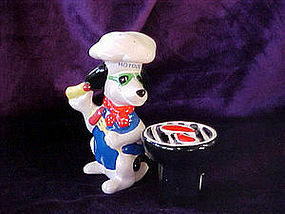 This one has not got the wick holder or globe. 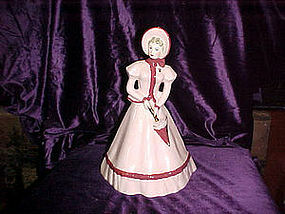 (these items are usually replaced anyway) A very pretty style, stands on a footed base. You can see some bubbles in the old glass. 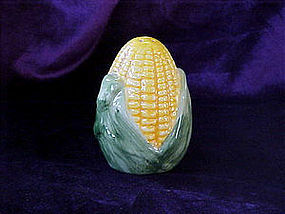 Also a crease in the glass made in the mold. (at a glance it first looks like a crack) Guarantee it's not! The base has 2 rows of little 6 sided hobnails for the pattern. Very simplistic but nice. No chips, cracks, or repairs. 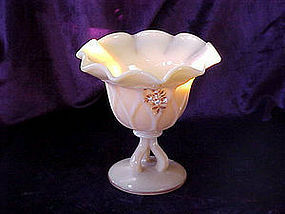 A pretty old lamp. 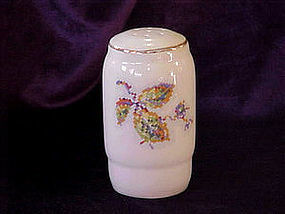 Popular pattern but this onehas an unusual color for the base. 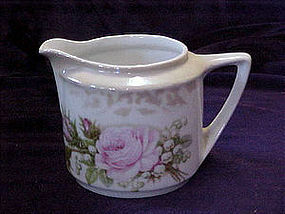 The base is a champagne pink. 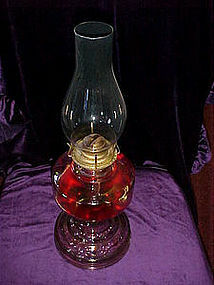 Picture shows red lamp oil in lamp, but the color is not a reflection from this. 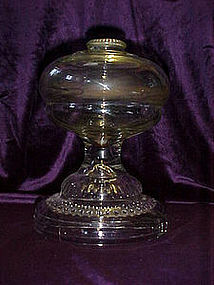 The base of the lamp also has the pretty curley-Q patterns in it, while the top is plain, clear glass. 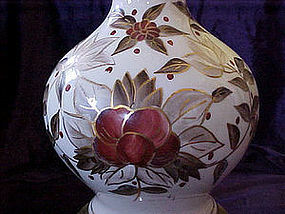 It measures 9 1/2" to the top of the neck. Overall size with chimney on is 18 1/2". Very good condition, with no chips, nicks, or cracks. 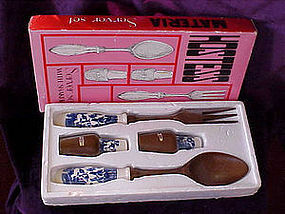 This is a lovely little piece of Nippon. I believe it is a pin tray for a ladies vanity. 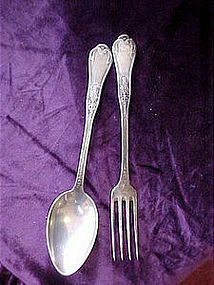 It is oval in shape measuring 7 1/2" long with handles which point upward, on the ends of the dish. 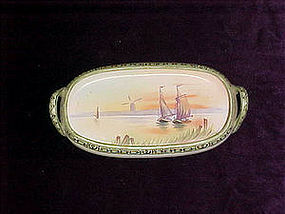 It has a relief border, and a scenery of three ships sailing with a sunset in the background. It has the green Nippon wreath marking on the back. This is in absolutely wonderful condition!! It is very pretty. Email me if you would like to see a photo of back stamp.